"Doubt is not a pleasant condition, but certainty is an absurd one." -- Voltaire, quoted in Mervyn King, The End of Alchemy. "At the heart of modern macroeconomics is the same illusion that uncertainty can be confined to the mathematical manipulation of known probabilities." -- Mervyn King, ibid. p.121. 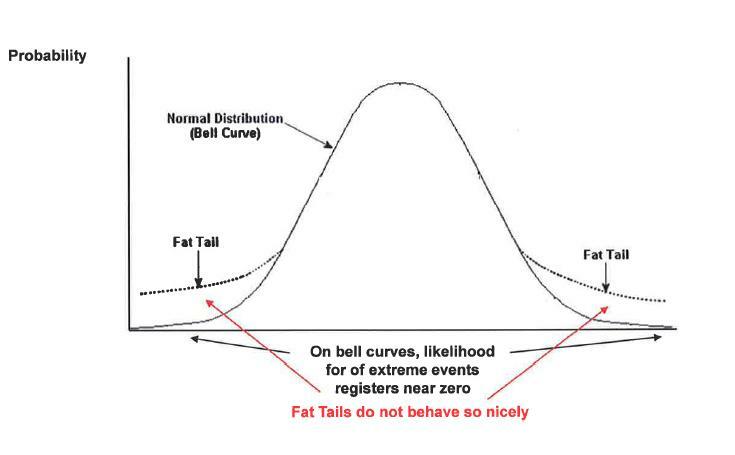 As has been argued elsewhere, for example in Taleb's Black Swan and in Mandelbrot et. al. 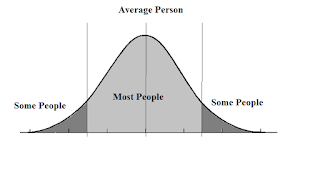 The Misbehaviour of Markets, many market analysts, economists, politicians and others, including probably most of us ordinary folk, imagine that most things stay more-or-less the same most of the time, and when things change they do so within reasonable boundaries. 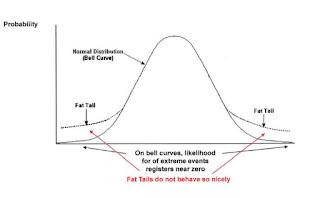 Those of a mathematical persuasion may further imagine that things follow a normal or Gaussian distribution, that is, events are distributed in a bell-curve, in which very few things are extreme and most things are more-or-less average. This is the case with things like people's height, for example, or fitness, or biological variables (see my earlier blog post about the misuse of this) or workers' incomes (excluding oil billionaires and bank executives). However it is not the case with non-linear dynamic systems. What, I hear you ask, is a non-linear dynamic system? It is any system in which there is any degree of complexity in the relation between inputs and outputs, and in which the outputs feed back as inputs. An example is the weather and the so-called butterfly effect, in which the flapping of a butterfly's wings can change the course of a tornado several weeks hence. An outcome can be radically changed by a small change in initial conditions. This is why even with much more powerful computers it is unlikely that the weather will be predictable with any accuracy more than ten days ahead, because it is simply not feasible that we could ever measure the initial conditions with sufficient accuracy. When we come to the stock market there are so many variables and so many unknowns that long-term prediction is impossible. Someone bets on an oil company, then a major accident happens and the stock falls, or else someone announces a major breakthrough in solar power and the stock falls, or there is a war involving a major oil exporter and the price of oil rises. I such cases the unexpected occurs frequently and is better represented by some kind of fat-tailed distribution, in which uncommon events happen more frequently. There are up-sides and down-sides to this. Our lives in general are subject to the unexpected. We enjoy the stability of relationships and our homes and jobs and we value living in a country that is not at war, if we think about it at all. But the unexpected does happen. We prefer not to think about it, other than the approximately 1 in 14 million chance that our lottery ticket will win. The up-side of the butterfly effect, though, is that if the beating of the wings of a butterfly in China can change the course of a tornado on the other side of the world, imagine what the effect of a smile could be! A Mermaid in the Bath is now available in Mexico! I have made it especially cheap in Mexico because Lola in the story is Mexican. I have also made it especially cheap in India just because I feel like it. If it is cheap in the USA that is because of Amazon's pricing policy, however I do not think that the official price of $3.99 for the Kindle edition is all that much for a philosophical love story. Free ebook of Silly Stories by Milton Marmalade! 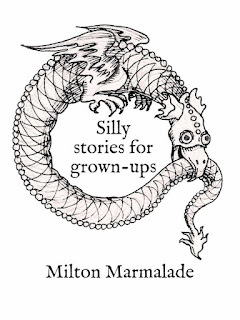 I have created a selection of stories entitled Silly stories for grown-ups. It is in Kindle format (also readable on your mobile phone with the free Kindle app) and you can get a copy by subscribing to my emailing list (not the same as the signup for receiving notifications of blog posts). It contains such gems as The girl who was not a vampire and The true story of Redcap and the Wolf, and how vengeance was wreaked on the woodcutter. There is also a drabble (a hundred-word novel) called Love in space, and a couple of other things to brighten your early morning commute. Don't read Chocolatina on public transport as random giggles tend to create an odd effect on other travellers. My daughter aged 4 was pinched by another child at nursery. Apparently there was no provocation, and in any case I know my daughter to be a placid and non-aggressive child. One of the nursery teachers told my daughter to pinch back, 'to show him what it's like.' My daughter did as commanded, but with reluctance, and in a way that amounted to a touch rather than a pinch. In her own way my daughter was resisting the command, or carrying it out under duress and with minimum force. It was the furthest she felt she could go short of open defiance. But clearly she was not happy with what she had been told to do. On the one hand I felt admiration for her, that a small child already understands what is 'not nice' and has the understanding not to do things that are 'not nice' to others, even if told to by an adult. On the other hand she is at an age at which she has to learn to obey, simply because there are a huge number of aspects of the world that she does not yet understand, and there isn't always time to explain them. 'Stay on the pavement!' must be obeyed sometimes without question. Going to bed at the right time is another thing that has to be done whether the child wants to or not. Without obedience a child may do all manner of things, pulled this way and that by the impulses of the moment, and lack the structure that is necessary for a calm and healthy life. My preliminary conclusion is that, in the usual order of things, obedience must be learned first and conscientious objection later, even if in the case of the pinching, conscientious objection has begun early. For us as adults also, inner self-control has to be developed as a strong base from which occasional necessary resistance to what is expected of us is possible. A Mermaid in the Bath is now available in Kindle format! Well this took a while! There are books out there that tell you that you can convert your word-processor files into e-books in an hour. But it takes a lot longer than that if you care about the look and feel of the result. While an e-book can never quite match the experience of having a real book in your hands, I have done my best to put into the Kindle version the little images that are scattered between sections of A Mermaid in the Bath, including mermaids, starfish, jellyfish, an evil-looking squid and the wonderful union-jack underpants. The lovely mermaid facing the title page I had to leave out because Amazon charges authors by the kilobyte for the so-called download fee. Even so a smaller version of the sleeping mermaid is still to be found in chapter 44. Ah me! Because of the download fee I had to reduce all the images to the minimum file size possible without losing too much quality. Current e-readers will not support the 600 dots per inch that print allows in any case. That's why it all took a long time. Anyway, it's a work of art and it's a bargain at less than the price of a cup of coffee.